Since April 2014, Kerstin has served as Executive Secretary ad interim of the Basel, Rotterdam and Stockholm Conventions. Kerstin joined the Secretariat as Deputy Executive Secretary of the Basel, Rotterdam and Stockholm Conventions in November 2012. 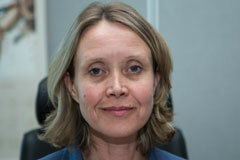 Kerstin leads the management of the Secretariat and performs the representational functions for the Secretariat. She is responsible for the operational implementation of the work programmes of the three conventions, overseeing their implementation, and monitoring and reporting on the delivery of the work programmes. Kerstin supervises and directs the work of the branches of the Secretariat, with a view to achieving synergies. Formerly, Kerstin held the post of Director for international environmental governance at the Ministry of the Environment, Finland. From 2001 to 2006, she served with the Nordic Council of Ministers while based in London as Secretary for the Nordic Genetic Resources Council and helped prepare the Nordic countries for the access and benefit regime under the Convention on Biological Diversity. Kerstin is a citizen of Finland.